The 4th episode of the show starts. They begin by talking about the then upcoming Golden Week. Golden Week is a collection of national holidays: Showa Day (April 29), Constitution Day (May 3), Green Day (May 4), and Children’s Day (May 5). It is one of the busiest holiday seasons in Japan. They talk about how unlike other people who are happy to take much-needed break from work, seiyuu like them are filled with dread during a long holiday period like Golden Week because they are not sure whether they’ll be forgotten or dropped from the roles they’re hoping to get. Kamiya also reveals that it’s kind of bothersome because this is also the time when scripts come and go for them to review, so instead of resting, they need to study. Kamiya: Ahaha! I’m so sorry about that. Kamiya begins a conversation about the episode title. Kamiya: Sorry about that, okay? Kamiya: I know that your bag isn’t a trash can. Kamiya: It’s all just a coincidence. There were trash on top of the desk and I was going to throw them away but your open bag just happened to be in the way, and they fell inside. OnoD: You were dunking those trash into my bag. Kamiya: (in a cute and childish voice) I didn’t do it on purpose. Understand it already. OnoD: I know. It’s just that people keep on calling me the gakuya banchou but I think that Kamiya-san fits that role more than me. OnoD then reveals that the candy snack he bought from the previous Friday was now destroyed into pieces inside their packs because HiroC was dunking those things inside his bag. Kamiya: Ahahaha! I’m 32 years old! Do you have a problem with that?!! Kamiyaaaaaa-san so adorable! In previous episodes, he was the one who acted like a guide to the younger OnoD, but in this part of the episode, it was obviously OnoD who seemed like the more mature of the two. So cute! They begin reading letters sent to them by their listeners. Kamiya: I’m kinda shy being called by my first name. I’m so happy that I decided to listen to this show during my sleepless nights. I always look forward to listening to your voices which I adore every week. Recently, I got addicted to matcha desserts such as puddings, cakes, and the like. Do the two of you have any current obsessions at the moment? Matcha is finely-ground green tea powder. OnoD: Hmmm. Current obsessions, huh? Does it have to be food? Kamiya: Even if it’s not food, just share any current obsessions that you have. OnoD: Oooooh. Well, uhm. Recently. . .well, I’ve liked it before but I’m really into drinking a lot of beer nowadays. OnoD: It’s all about beer, beer, beer for me recently. Kamiya: Beer, huh? So you like drinking beer? OnoD talks more about his obsession with beer, even sharing some of the kinds that he likes to drink. OnoD: I think to myself, beer is really delicious! Kamiya: Really? But when you think about it, beer is just bitter water, isn’t it? Kamiya: It’s not delicious at all! OnoD: Just wait a minute. OnoD: Does that mean that you don’t like beer? Kamiya: Well, I’ll admit that recently I’m thinking that beer is kinda good. . .
Kamiya: But even before that, I don’t really like drinking any alcoholic beverages. It’s only very recently that I’m thinking, oh, beer is good, but before I was like, what the heck is with this canned bitter water? OnoD: What the heck? If the people making beer hear what you’re saying now, they’ll cry. So what do you take after drinking beer? Kamiya: Hm. What do I take? Uhm, I drink Oolong tea. OnoD: Ah, Oolong tea, huh? Kamiya: When everyone else are hopelessly drunk, I just drink Oolong tea and I’ll be alright. OnoD: So you just drink Oolong tea and you’re okay? Kamiya: Yeah. I have a lot of confidence because of this. OnoD: You’re really something, Kamiya-san. Kamiya: Anyway, do you have any bad experiences about drinking beer? OnoD: Hmm. Not really. My face doesn’t turn red unlike others and I don’t really feel sick at all after drinking. Kamiya: I’m envious. As for me, whenever I drink too much, my head begins hurting immediately. OnoD wonders why Kamiya still acts so energetic even when he drinks Oolong tea which is said to be calming. Then they share about an incident from the previous year (2006) during a New Year’s Party when the two of them drank together with other fellow seiyuu Sugita Tomokazu (杉田智和), Nojima Hirofumi (野島裕史) and Kirii Daisuke (桐井大介). Kamiya: I just happened to meet Sugita-kun at the entrance of a gamecentre. Sugita-kun was like, “Nii-san, we’re going to have some New Year drinking party. You want to come with us? And Ono-kun already went ahead with Nojima Hiro and Kimoi-kun and then. . .
Kamiya: I meant Kirii Daisuke-kun. Then Kamiya continues to talk about how smart Sugita was because he bought a senpai (Kamiya) to pay the bill. As a result, Sugita didn’t have to pay with his own money. OnoD marvels at Sugita’s shrewdness. So funny! They move on to the second letter. Good evening! When sending regular e-mails, are you Team Emoji or Team Kaomoji? Oh my gosh, my fellow dear girls and dear boys. Brace yourselves because this part is the cutest!!!! Kamiya: We don’t use them, right? OnoD: You’re right. (remembers something and then chuckles) But you know what? OnoD: Why does your face look so uneasy? Kamiya: I don’t like the expression you’re wearing on your face. OnoD: After recording the first episode of this show, it was already late, wasn’t it? OnoD: Then we took separate taxis home, right? While I was riding my taxi, you sent me a “good work and thanks for today” e-mail, didn’t you? Kamiya: Yes, I did. I bet it made you feel good. OnoD: Then you also said, “It’s always me doing all the talking!”. OnoD: You were like, “What the heck was that? Oy. Don’t let me do all the work. You should talk more!” And then. . .
OnoD: I was like, “Crap!”. OnoD does his best to share the incident in detail, saying that he self-reflected about his poor performance and strengthened his resolve to work harder and come closer to Kamiya’s level and enter the proverbial “onarimon” (gate of honour). OnoD: And so I apologized and promised that I will talk more and work harder in the future. Kamiya: Yes, I received that e-mail. OnoD: I was expecting a really sadistic reply from you, Kamiya-san. Kamiya: (embarrassed and flustered) Shut up! Kamiya tries to leave the subject and quickly reads the script for the next corner, but he can’t stop laughing. Both of them can’t stop laughing. So cuuuuuute!!!! Kamiya reads the announcements using a super-duper adorable cat voice. So cute!!!! They invite you to visit the DGS website and check out the chakushin voices recorded by them. 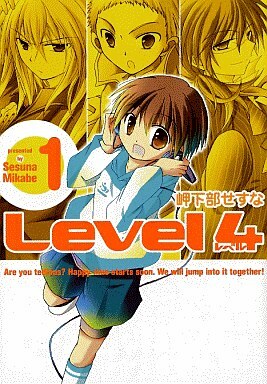 They feature the manga Level 4 (レベル4) by Mikabe Sesuna (岬下部せすな). Kamiya continues to read using his adorable cat voice but catches himself and says that he should stop. OnoD can’t help commenting how cute Kamiya is. Aaaah! I’m in paradise whenever I listen to these two. They introduce the manga and even read some lines. Both of them sound so adorable! After reading some of the manga’s lines, they think it’s cute and very interesting, so they talk about which character they want to play. Then OnoD reads Mikabe-sensei’s letter. Whenever I draw manga, I always listen to music but my repertoire is running out of new music. Do you have any good background music that you could recommend to me? Kamiya: I see. Today we received another very mangaka-like problem, right? Indeed, when you’re drawing manga, you need something that will help you concentrate and listening to music is a good way to do that. OnoD: Yeah. That’s right. It makes you get into the rhythm. Kamiya: Ono-kun, what kind of music do you like? OnoD: Hmmm. Right. I like, uhm, I like pop songs. Like songs by Chage and Aska, and also Sukima Switch. I also worked in the anime Air, and I really like the opening theme song Tori ni Uta. Chage and Aska are a pop music duo. Sukima Switch is also a duo but they mainly sing jazz style music. OnoD played Kunisaki Yukito in the anime Air. Listen to Air OP theme song Tori no Uta here. OnoD explains that while he likes most of the theme songs of the anime he’s involved with, he doesn’t really feel strongly for all of them. But when he heard Tori no Uta, the OP theme song of Air, he even became interested in using it as a ringtone. OnoD: Ah, ah. Wait, wait. I have one more. I highly recommend this. Layla. Layla is played. Watch Eric Clapton’s Official Live Video of Layla at Hyde Park here. Kamiya admits that the song makes him tap his fingers in time with the beat. OnoD: Doesn’t this song make you feel cool? Kamiya: Don’t make that “I look so cool” face! Weren’t you been told that you giving this impression that you think you’re so cool is kimochi-warui? OnoD: Wha–?! Who said that?!! Kamiya: Well, it’s just that recently you’re like, “My voice is cool, isn’t it?” And it’s a bit kimochi-warui. OnoD: I think I know who’s been saying those things about me. I think it’s that guy. Kamiya: Well, there are two of us who think that way. Kamiya: As for me, how about this song? The OP theme song of Hyakujuu Sentai Gaoranger (百獣戦隊ガオレンジャー / Hyakujū Sentai Gaorenjā) is played, one of the shows from the Super Sentai TV series which Power Rangers is based. Watch a live performance of the song here. Kamiya & OnoD: (roaring their hearts out) Gao! Gao!! GAOOOOOOO!!!! Kamiya: The TV show really gets you going, doesn’t it? Especially this opening theme song of Gaoranger, it’s awesome, isn’t it? OnoD asks Kamiya why he chose this song. Kamiya shares an incident where he got involved in one of the local events promoting the TV show and he was in charge of voicing Gao Red Ranger. And then during the event, the female MC asked everyone to sing the theme song and they all did. That’s when he realized that he really liked the song. Such a funny story. OnoD: But will listening to this song while drawing manga a good idea? Kamiya: Well, I don’t think so but it’ll surely wake you up, you know! Kamiya defends his choice of music. He really thinks that it’s an amazing song. They also imagine what Mikabe-sensei will look like if she listens and shouts GAO while drawing her manga Level 4. Then Kamiya continues to say that he loves listening to theme song albums again and again, to which OnoD confirms it’s one of the reasons why other male seiyuu idolizes Kamiya because he’s so passionate. Afterwards, Kamiya shares another incident where he encountered a taxi driver with a big smile on his face. He first wondered why the driver was smiling so widely. He was about to ride the taxi when he learned the reason: a Gundam theme song was playing inside the car! Oh, so that’s the reason, he thought. They finish the funny conversation and OnoD begins reading the program script, while growling GAO at random times. So funny! OnoD reads a Dear Letter sent by Shione from Tokyo. A new school and a new class. Not a single person I know. I almost gave up from the pressure of a new school. As usual, I don’t have the courage to talk to other people, and I can’t even greet properly. For someone like me, a kind person like you greeted me “Good morning”. You helped ease my unease. That was April 9th. With that one line alone, I feel that I can get through anything this new school year. Thank you. Until I can say these words directly to you, please wait. Of course, please continue to be friends with me until then. There are still a lot of things that I want to talk with you about. Kamiya: I see. Shione-san’s 15-years old, right? She just entered high school. She had to go to a new, different school separate from her friends from middle school. A new school, a new class. Indeed, being greeted with even just a simple “Good morning” can make your day, right? The conversation becomes deeper and more serious. OnoD says that something as simple as a greeting can make one feel so happy. He says that even he’ll feel happy if someone greets him. Kamiya agrees and tells him that they should keep on greeting each other “Good morning” again and again. OnoD adds that a “thank you” is very precious. Kamiya: Yes. I’m going to continue playing MonHan after this. Kamiya: I wrote a note to myself in my script, so I won’t forget to play it. OnoD: You actually wrote it? Ah, but wait. I just remembered. . .
OnoD: He called and asked me, “Are you free right now?” And I answered, “Ah, I’m kinda tired now, so I can’t.” And Yasumoto said, “We’re playing MonHan.” So I refused him for the second time. But then he handed the phone to a sulking Kamiya-san. OnoD: Wait, wait. This radio show is titled “Kamiya Hiroshi AND Ono Daisuke’s Dear Girl Stories”. It’s both our show. Without you, it would be impossible. You’re such a tsundere, Kamiya-san. Tsundere Kamiya is so cute! But OnoD is also so sweet for giving such importance to his partner. I love this episode! Definitely one of my favourites. And that’s it for the 4th episode of DGS.